After I took the Desert Queen Ranch Tour, an attraction operated by the National Park Service in the Joshua Tree National Park, I could honestly say that if I accomplished in my lifetime a tenth of the things Bill Keys did in his, I would die a happy man. Keys and his wife, Frances, didn't just survive here in their desolate lonely ranch, now surrounded by the park, they thrived. 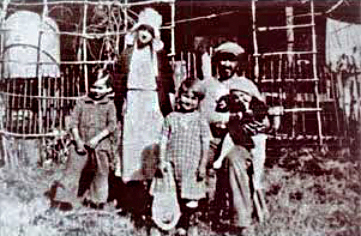 Bill, Frances and some of the Keys children, circa 1930s. Photo courtesy of Joshua Tree National Park. There seems to be some disagreement about where Bill Keys came from. A park brochure says that he was born in Russia in 1879 as George Barth and that his family moved to Nebraska when he was fourteen. According to Robert Cates' book about the area, Joshua Tree National Park: A Visitor's Guide, Keys was born in Palisades, Nebraska. It is agreed, however that Bill Keys left home when he was fifteen, and he changed his name from George Barth to Bill "Key" when he joined Teddy Roosevelt's Rough Riders, although nobody hazards an explanation of why the name change was necessary. Just before shipping out for Cuba, he broke his leg and got left behind. Much later he would add the 's' to the name "Key" to avoid confusion with another Joshua Tree pioneer, John Kee. 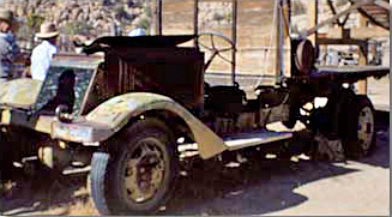 Keys started out as a caretaker for the Desert Queen Mine around 1910. He took up residence at the now-dormant mill, the site of the park's tour. In 1915, the absent landowner, William Morgan, who had never actually paid Keys for five years of service, died. Keys filed against the estate for payment of back wages, asking for the Desert Queen Mine and the mill site. Having that, he then filed a homesteading claim for an additional one hundred and sixty acres. In 1918, Bill lured Frances May Lawton out of Los Angeles into his pioneer life. It was fifty miles to the nearest center of civilization. She was the perfect partner for Bill: creative, productive and smart. 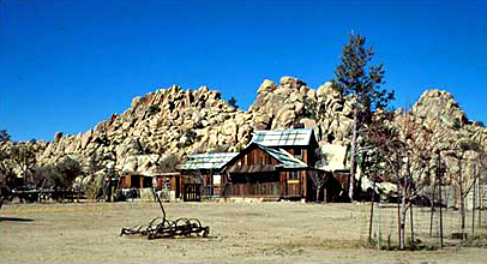 Over the next fifty years, Keys mined, ran stamp mills for other miners, farmed, raised cattle, built five dams out of the local stone and little else, improved upon existing dams, built roads (including one still bearing his name), explored the desert extensively, and started the first grade school in Joshua Tree. Note how canted the radiator is on this truck. Could it be a WWI French Army truck? Meanwhile, Frances gave birth to seven children, buried three and raised four. Pictures of her garden make me green with envy. She canned four hundred quarts of food from that garden every year. 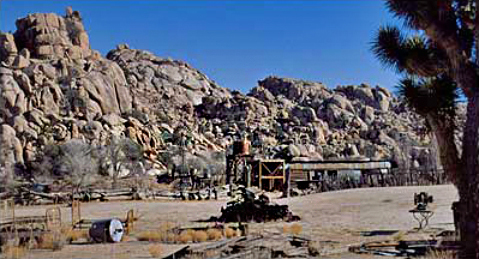 In 1936, the Joshua Tree National Monument was created, completely encircling the Keys' ranch. The ranger collected our tickets and had us drive through the gate until we were all in. At 2:00 p.m. promptly, she closed the gate and led us into the ranch proper. About half a mile in, our caravan circled around and we all piled out, right at a weathered wood building that was the original Joshua Tree Elementary School. I suggest you bring water and a hat for the tour. Although the brochure urges you to bring sturdy hiking boots and a jacket, the hike at best requires comfortable tennis shoes, and on the day we went, we left our jackets in the car. The tour is ninety minutes long. You walk down to the main area of the Desert Queen Ranch, taking a peek into Keys' workshop, where he fabricated tools and mastered ways to fix and mold the things he needed, and then visit his orchard, his rough-hewed home, and his small stamp mill. Keys built an imposing dam behind his home where the water was known to stretch back two miles. It would freeze over in winter, and his kids would go ice-skating. It was occasionally stocked with fish. There is yet another unfinished dam behind his house, and here Ranger Miriam showed off Keys' masterful methods of masonry with few tools, working with the grain of the stone to break even, neat squares with little effort. 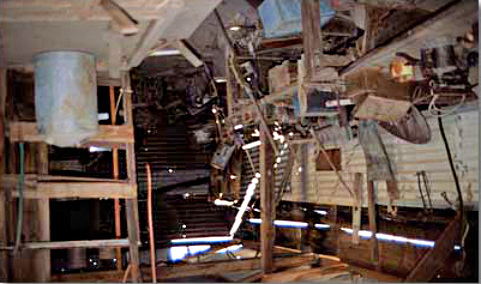 Bill Keys' workshop. Here he fabricated tools from whatever he could scrounge to maintain his operatiion. Finally, the tour brings you to another one of Keys' secrets to success; he was an organized and meticulous packrat. When others failed and gave up, he would go to their homesteads, determine that indeed the property was abandoned, then strip it of anything that might be useful. Surely, to leave it to rot in the sun or be ruined by vandals would be wasteful, a luxury not allowed in the desert. He picked up entire structures and hauled them back to his ranch. Tools, bolts and screws of every size and description were laid out so that he, and later, prospective buyers could quickly and easily find what they needed. As growing numbers of tourists came to the park area, Frances opened a little store, and the Keys even rented out cabins for people who wanted out of the cold, providing stoves for women sick of cooking over open fires. Bill and Frances Keys on the frozen reservoir, shortly after his release from prison. Photo courtesy of Joshua Tree National Park. In 1943, in an incident straight out of a western dime novel, a former deputy sheriff named Worth Bagley ambushed Keys just outside Keys' ranch. Bill returned fire and shot Bagley to death. The trial was a mockery of justice, with some powerful cattle ranching interests twisting the results against Keys. Bill was found guilty of murder and sent to jail. At age sixty-nine, after five years in prison, with friends he had made throughout California rallying to his defense, Keys was released from prison. Without a hitch, he went right back to work, rebuilding what had decayed while he was away. Five years later he was given a complete pardon. In 1950, he and his children finished the last improvements on Barker Dam. You can see their inscription on the dam today. In time, Bill became a source of stories about the area. He had known everyone, and done most every thing in the park. This is the wall of the last dam Keys was working on. Look how well the stones mesh together, then contemplate how he managed that with no stone cutting tools. The last stop on the hike is the schoolhouse. Frances and Bill knew there was a world outside of their hard-won oasis, and they wanted their children to have the option to explore it. Education, they believed, was the tool. Bill hired a teacher and built a place for them to study. Pretty soon all the local homesteaders were sending their children to the Keys school, and shortly after, the county took over responsibility for the Desert Queen Elementary School. All of the Keys children left their parents' desert paradise and went on to long successful lives. In 1963, Frances died, and six years later, on June 28th, 1969, Bill Keys joined her. As we left the Desert Queen Ranch, I spotted a fresh, clean American flag snapping in the steady breeze. Below it, a wrought iron fence surrounds the graves of the Keys family; Frances, Bill and three of their children are buried there. The headstones acknowledging each grave, including his own, had been cut by Bill Keys himself. 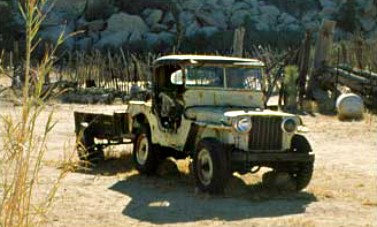 A classic Willy's Jeep, especially interesting as it may be a pre-war nonmilitary Willy's. To reach the Desert Queen Ranch entrance, where the tour begins, turn into the Hidden Valley Campground (one of nine campgrounds in the park), then almost immediately turn right down a dirt road. If you're in the campground proper, you've gone too far. Follow the dirt road until it ends at a "T," then turn left. Shortly, you will come to the closed gate to the Desert Queen Ranch. A ranger will meet you there. Keys Ranch tours cost $10 per person aged 12 and over and $5 for children 6 to 11. Children under six are admitted free. Senior and Access Pass (Golden Age and Golden Access passport) holders pay $5. These tour fees do not include the park entrance fee of $20 per car, good for a seven-day visit. Entrance fees are payable at park entrance stations. Oct 15 - May 20: tours are offered only on Fridays and Saturdays at 2 pm and Sundays at 10 am. Summer Schedule: from June 1, 2016 through September 30, 2016, tours are offered only on Saturday afternoons at 6:00 pm. Groups are limited 25, are half-mile in length and last 90 minutes. Plan to arrive about fifteen minutes early for introductions and explanations. Tickets are no longer sold at the ranch gate. For more information see the Park Website. 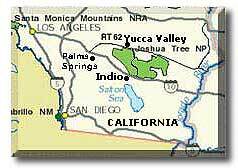 For additional information about Joshua Tree National Park, located about one hundred and twenty miles east of Los Angeles. There is no lodging in the park, however there are nearby motels, hotels and many camping sites in the park. For more information or for on-line camping and motel reservations click here.